As a frequent restaurant goer who tries to keep up with the DC area dining scene, I have a dilemma. Is it more important to constantly sample new places, or is there value in returning to the tried and true? There are so many unexplored restaurants on my to do list that it actually makes my head spin. At the same time, one of the ways I judge a restaurant is how I feel about returning. Whether I actually return in a reasonable amount of time is the true indicator of my feelings. When my BFF invites us join her for a birthday celebration at Woodberry Kitchen in Baltimore, I am delighted. She and her husband have never been. But I’m also thinking, can another visit live up to my own hype? And what about Pabu? If we’re heading to Baltimore, shouldn’t we try the area’s new darling of the dining scene? It feels like the Woodberry Kitchen buzz has died down a bit, and I wonder if this is just because the newest always gets the most attention. As we arrive, it is clear that there has been no slowdown in WK’s popularity. The place is hopping and the hallways are filled with people waiting for tables. I check in for my reservation and get a cheery “welcome back!” This gives me the warm fuzzies. Now here’s a reason to visit a restaurant more than once. Familiarity breeds….appreciation. 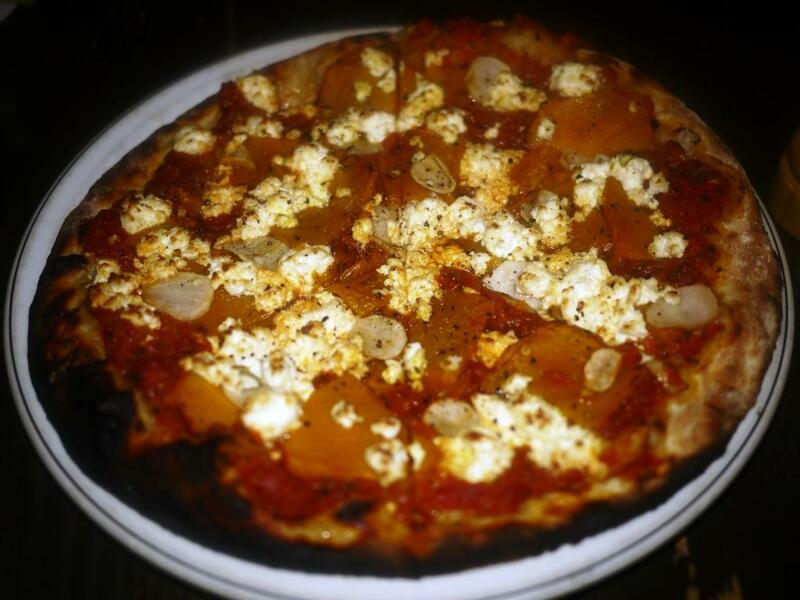 We begin our meal with a wonderful flatbread of pumpkin, tomato sauce, ricotta, chili oil, and sunchokes. It is far superior to any pizza-like dish I’ve had in recent memory, from the crispy exterior to the fresh slices of slightly sweet pumpkin, and just the right amount of heat. A well-prepared dish always brings me to a happy place. WK’s Marvesta Shrimp Out of the Oven makes me joyful. The shrimp is brimming with flavor, with flecks of pepper and an underlying sauce spiced with horseradish, garlic, butter, and paprika. 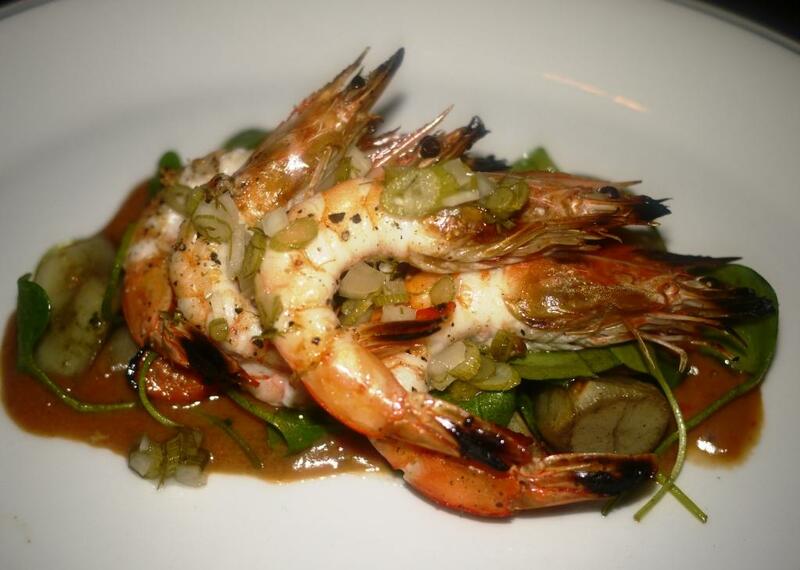 According to its website, “Woodberry Kitchen relies on longstanding relationships with the growers of the Chesapeake to provide the ingredients that nourish and delight our guests.” This dish, made with shrimp naturally raised in Maryland, exemplifies how well Chef Spike Gjerde does in meeting this goal. It’s another reason I was attracted to WK in the first place. I am relieved by the reactions of BFF and her husband. 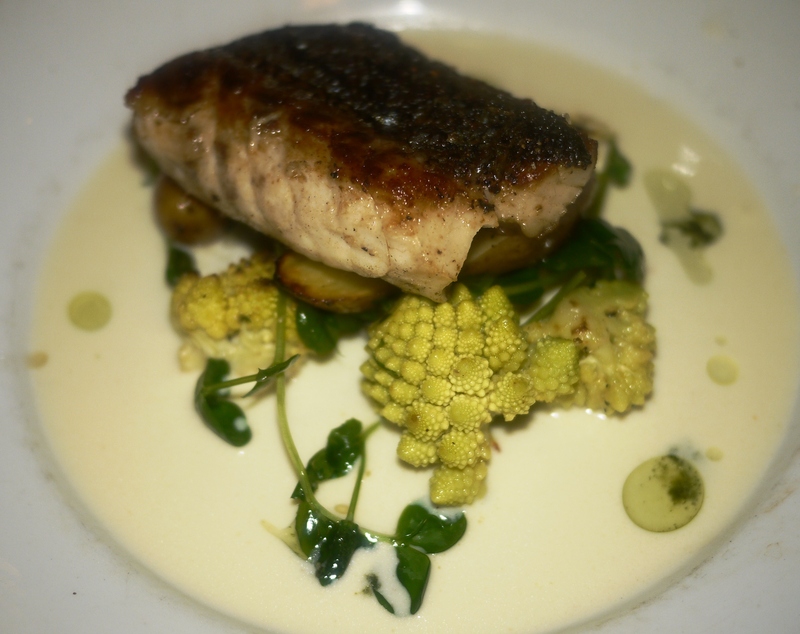 They marvel at the rockfish with its crispy skin dusted with salt, light creamy sauce, and an accompaniment of beautiful cauliflower. 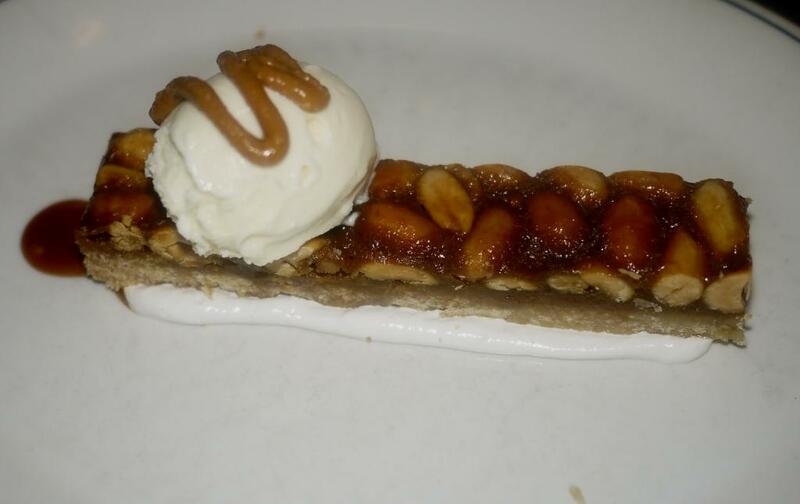 Of course no birthday celebration is complete without dessert, so we order apple tart with maple ice cream as well as peanut chew with fresh cream ice cream. The kitchen also sends out a complimentary dish of lemon lush ice cream with “Happy Birthday” written on the plate in chocolate. I’m guessing this is the work of our server who has amiably guided us through the entire meal. 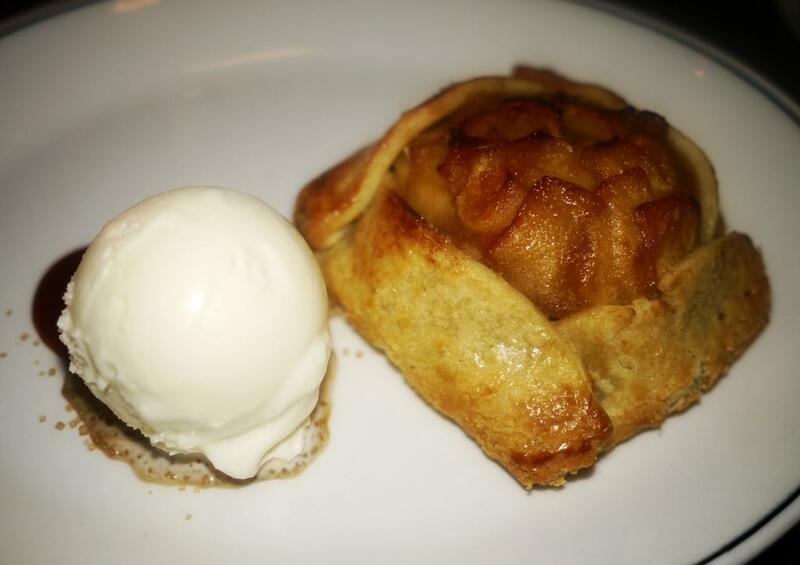 The ice cream at Woodberry Kitchen is rich and creamy, with strong developed flavors. I’m delighted that we have a chance to sample three different kinds. It is undeniable that the discovery of a new restaurant can be thrilling. But at Woodberry Kitchen I learn that my next meal is very likely to be my best meal. In the words of Arnold Schwarzenegger…I’ll be back. This place is on my restaurant bucket list. I live in Columbia, but have never been! Elizabeth- you should move it up the priority list. It’s well worth it!